Curiosities & Wonders: New Collection Guides posted to ExploreUK! New Collection Guides posted to ExploreUK! 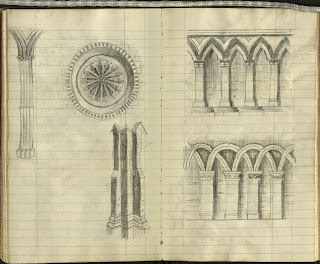 Daniel Weisiger Lindsey journal on the history of architecture, 1861. 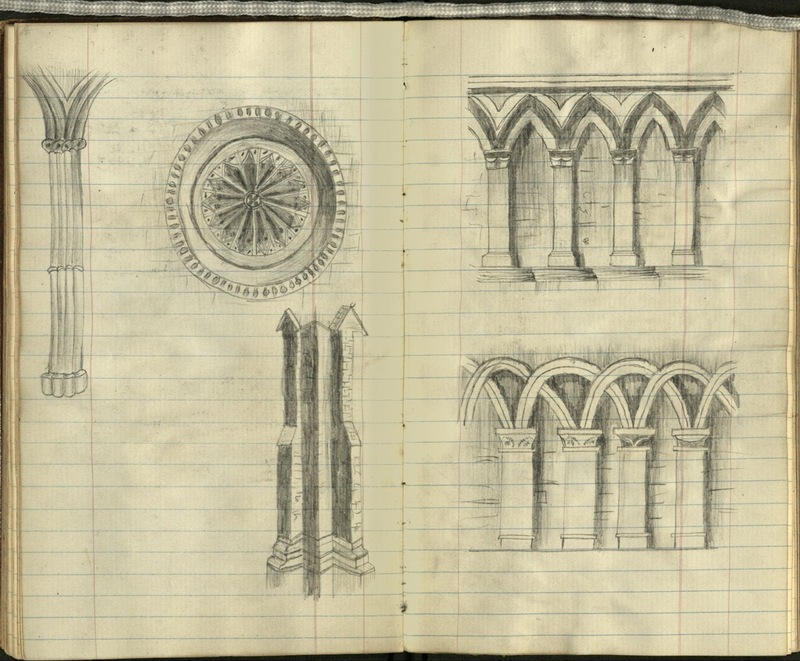 From the William B. Scott collection on Kentucky Architecture, 2015ms085. A new batch of collection guides have been added to ExploreUK! The collections document string bands, Kentucky architecture, women authors, Kentuckians during WWII, and affordable housing in Appalachia. See the full list below. The Crockett family papers (dated 1896-2016, undated; 3.09 cubic feet; 5 document boxes, 2 oversize boxes, 4 shoeboxes) comprise song books of original Crockett compositions, scrapbooks of song lyrics and performance reviews, tour itineraries and set lists, correspondence, and photographs that document the Crockett family and their shared professional career as members of the string band music group, the Crockett Family Kentucky Mountaineers. 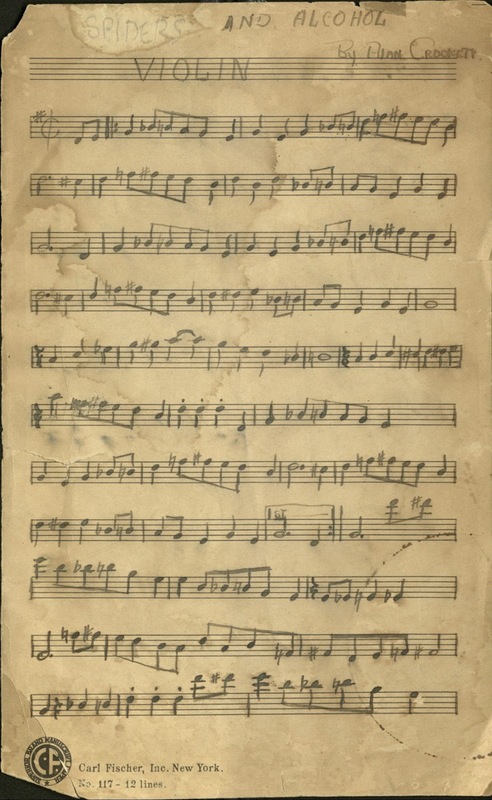 "Spiders and Alcohol" for Violin. From the Crockett family papers, 2017ms032. The William B. Scott collection on Kentucky Architecture (dated 1855-1960; 3 cubic feet; 1 flat box, 3 case folders, 6 boxes of rolled drawings) consists of architectural plans, drawings, notebook, and ledger collected by William B. Scott, architectural historian, mainly documenting various architecture firms and individual buildings in Louisville and Frankfort, Kentucky. The John W. Stevenson papers (dated 1868-1885; 2.25 cubic feet; 5 boxes) consist of diaries, letter books, receipts, and a will, documenting the life and career of Kentucky lawyer and politician John W. Stevenson. The Isabel McLennan McMeekin papers (dated 1850s-1950s, bulk 1940-1950; 0.9 cubic feet; 4 boxes) consist of manuscripts, photographs, a civil war scrapbook, and a book jacket, which document McMeekin's work as an author. 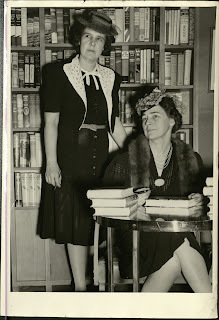 Dorothy Park Clark and Isabel McLennan McMeekin at Morris Book Shop signing for Show Me a Land, 1940. From the Isabel McLennan McMeekin papers 46m72. The Dearinger family papers (dated 1864-2007, bulk 1919-1945; 2.8 cubic feet; 5 boxes and 1 item) primarily comprises letters, memoirs, diaries, and World War II related materials, including photographs, that document the service of the Dearinger siblings of Lexington, Kentucky, John Arthur Dearinger, Emily Susan (Sue) Dearinger, and Eugene Lewis Dearinger. The Melba Porter Hay research files on Madeline McDowell Breckinridge (dated 1834-2008, undated; 3 cubic feet; 3 boxes) primarily comprise research notes, note cards, manuscript drafts, interview notes, and materials that document the research process of Melba Porter Hay while writing Madeline McDowell Breckinridge and the Battle for a New South. 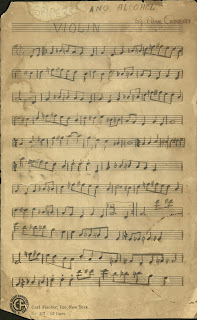 The William K. Hubbell papers (dated 1931-1938, undated; 0.33 cubic feet; 1 box and 1 item) consist of a scrapbook and published copies of writing and photographs by Lexington, Kentucky, writer William K. Hubbell. The Rogers and Anne Morton papers (dated 1945-1987, undated; 7.06 cubic feet; 32 boxes, 2 items) includes photographs, photograph albums, letters, and memorabilia relating to Rogers and Anne Morton during Morton’s travels as Secretary of the Interior. The Richard Alexander Spurr papers (dated 1844-1961, bulk 1878-1899; 1.3 cubic feet; 4 boxes, 1 folder) consist of correspondence, financial records, genealogical sketches, autograph albums, photographs, and a recipe book documenting Spurr's career and family life. The Federation of Appalachian Housing Enterprises, Inc. (FAHE) records (dated 1967-1992; 20.8 cubic feet; 21 boxes, 1 oversize box) consist primarily of office files and program files relating to FAHE's work on community development and affordable housing in the Appalachian Region.